Cutting down on carbohydrates with the Atkins diet is easy when you see the wide variety of proteins and vegetables that are on the acceptable foods list. However, it does take some time and adjustment to get used to this new way of eating. A lot of the American diet centers around complex carbohydrate foods like breads and pastas. Snack foods are full of sugars and refined carbohydrates. This new way of eating will challenge your old habits. However, there are many carbohydrate substitutes that can fill in the gap. Some of the most popular replacement items are sugar substitutes. These can be good or bad depending on how you react to them. Each person has a different reaction to artificial sweeteners like aspartame and Splenda. They can be helpful in baking low-carbohydrate treats and making things taste sweet without risking sugar use. However, many people find that using artificial sweeteners makes them crave sugar even more. If you find you want more sweet treats after drinking a diet soda or eating a snack made with Splenda, its best to eliminate them entirely from your diet. Bread is the number one challenge that Atkins dieters face when looking at their new diet plans. Bread is a staple food for many people, and eliminating it can be somewhat of a problem. There are some low carb breads available out there, but you have to watch for hidden carbohydrates and other unacceptable ingredients. If you are ambitious, you can try making your own bread out of almond flour or other non-traditional flours. Many people say that they love pasta, but people vary rarely eat it plain. The best part about pasta is the topping. So taking those toppings (meat, cheese and vegetables) and putting them over something else is an easy solution. Many people who follow the Atkins plan have found that squash makes a good pasta substitute. Spaghetti squash, a yellow orange gourd with stringy insides, is a natural base for homemade meat sauce. 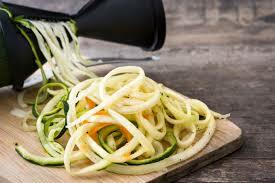 Zucchini is also a good pasta substitute. You can grate in into fine pieces or chunk it up into sections to act as a base for sauces. Lasagna is easily made with large pieces of eggplant as a substitute for the noodles. The meats and cheeses used in lasagna are low-carb so there’s nothing to worry about there. Another common problem for Atkins dieters is finding a good substitute for rice. One popular solution is to use cauliflower. Simply place the cauliflower florettes in a food processor and chop them until they are rice sizes pieces. Then microwave the “rice” without water. The pieces will come out fluffy and ready to be used in casseroles or as part of a side dish. Cauliflower is also a popular potato substitute for Atkins dieters. This time, puree the cauliflower until it is smooth and creamy, just like mashed potatoes. You can add your favorite low-carb topping to it like bacon, sour cream and cheese. Pizza is a favorite food for many people, but there are Atkins friendly solutions for homemade pizzas that taste just as good. You can make small pizzas using low-carb tortillas as the crust. You can also use the same method with large Portobello mushrooms. If the alternative crust options don’t sound good to you, you can also try a pizza casserole with all of the ingredient layered in a casserole dish. These substitutes will help you avoid indulging in your high-carb favorites while on the Atkins diet. 0 Response to "Carbohydrate Substitutes for the Atkins diet"